EON ZFS Storage 151a9-071215 release! New to EON, read here first! Upgrading, read here first! If your EON Storage is internet connected. The EON ISO can be retrieved using wget. After running setup(new setup) or transporter.sh (upgrade/backup). Re-check/edit your POOL=poolname in /mnt/eon0/.exec. After running the new install for a few days and triple checking everything is ok. Only zpool/zfs upgrade is left, to access the new features of zpool version 28 and zfs version 5. 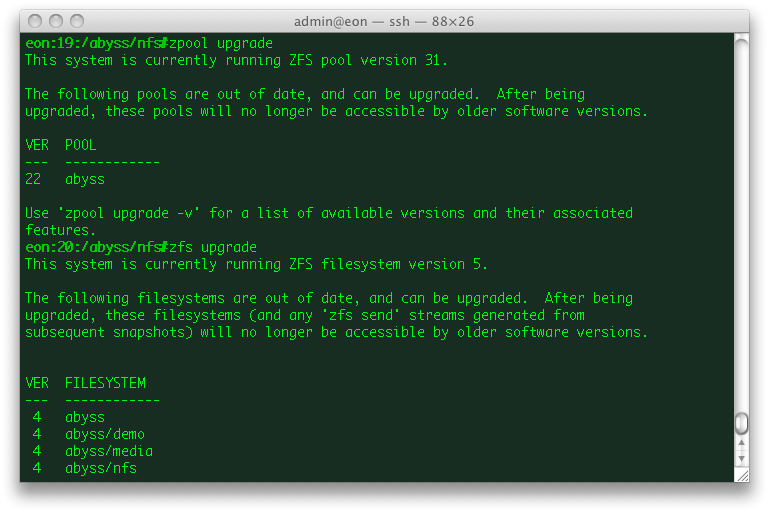 Note that once zpool/zfs upgrade is done, there is NO GOING BACK to the older version. 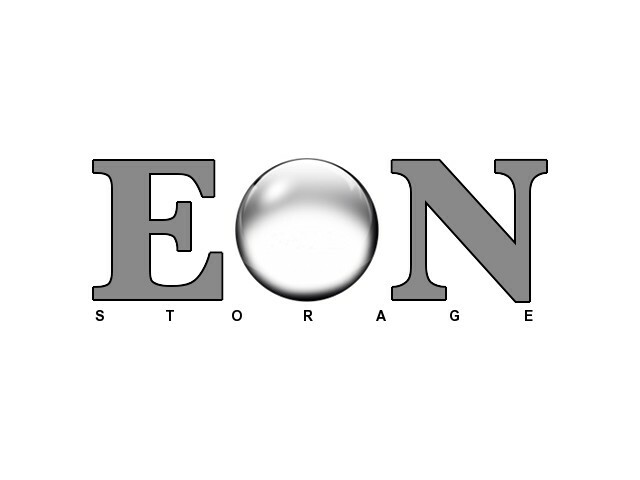 It's been a while since the previous EON Storage release. I know, I know, please forgive but as promised I have not forgotten or stopped. This release, 151a9-041815 will be the final OpenIndiana based release. Future EON Storage releases will be based on OmniOS. Their road-map simply seems like the best path forward. Just putting some final integration touches on the binary kit before making it available for download. List of changes in this release. - KVM error "WARNING: kvm: emulating exchange as write"
Here it is, a refinement update and process that allows for quick fixes, patch delivery to your EON ZFS Storage Appliance. Version 1.0 introduced some portable/temporary bits (slinky) because of external dependencies like Perl, size considerations and network packaging. Based on feedback from EON Storage users, these added slinky steps were at times confusing and troublesome. This update (details here) moves to eliminate the extra steps, moves closer to eliminate dependency on external bits(setup will no longer depend on Perl) and provides numerous refinement fixes for installation, setup, upgrading. Keep the feedback and ideas coming. There's more to come, storing the exciting year ahead! EON + KVM gives Win 7, FreeNAS and Linux the boot! EON with the addition of KVM hypervisor is shown giving the "boot" to a Win 7, FreeNAS, and Damn Small Linux. Also booted itself. This is still in early development and testing. EON ZFS Storage 1.0Beta based on oi 151a release! I promised everyone patiently awaiting the new release, a pre Dec 25th gift and HERE IT IS!!! Lots of hard work went into giving this release life. It has undergone many hours testing so I could deliver another "rock solid" release. This build, required 2 virtual machines, 3 physical test machines and 3 compilers. Please enjoy and feel free to post feedback or any anomalies encountered. 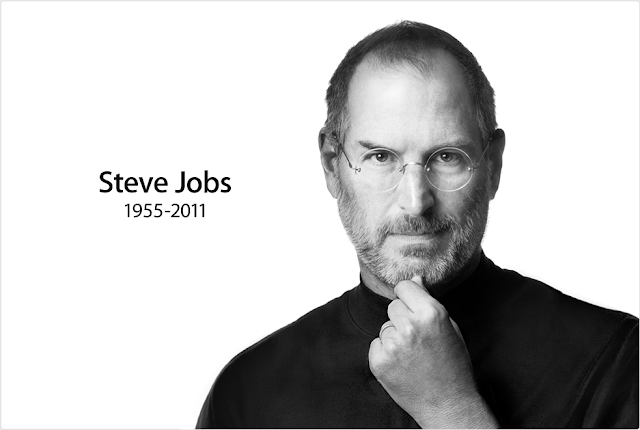 I hope EON continues to store all your precious digital moments! 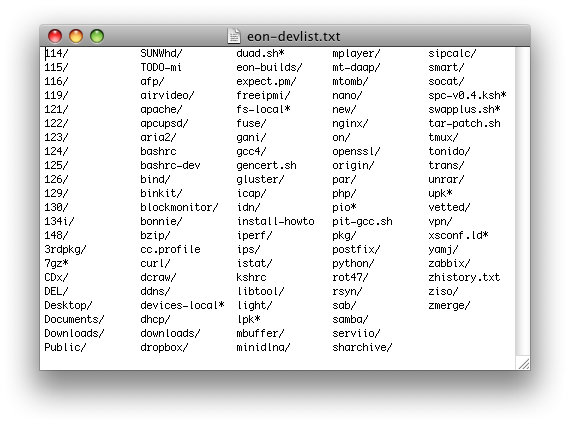 Perform the following on the EON command line to install the latest binary kit, remote installer and more. Most of these steps are one time only to add the bits that were not ready at release time. They will be self updating from here on. 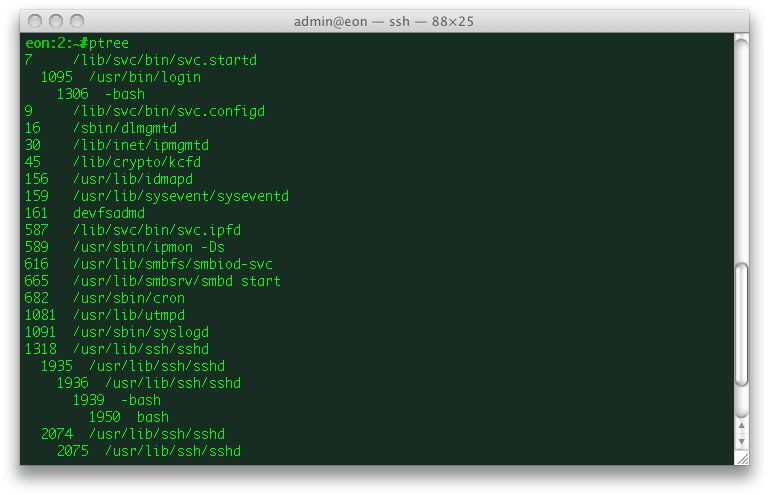 You can simply copy and paste 1 line at a time in an ssh session. Run "rail" to see more usage options. Web Server: Installing a web server (apache, lighttpd or nginx). Browse to your IP after starting a web server to see links to various apps. Run "emp" to see usage options. More detailed how to here. Python is a requirement for SABnzbd, Sickbeard and CouchPotato. SABnzbd: Installing and starting SABnzbd. More detailed how to here. Sickbeard: Installing and starting Sickbeard. More detailed how to here. CouchPotato: Installing and starting CouchPotato. More detailed how to here. New/Updated administration and statistics binaries. kernel line addition "-B disable-pcieb=true" under VMware. ESXi, Fusion, no longer required. S T O R E I T Y O U R W A Y ! It's been a while since the last EON release but we are almost there. It's been a road of many trials with IPS and patience from the EON community but we are almost at a polished new release. 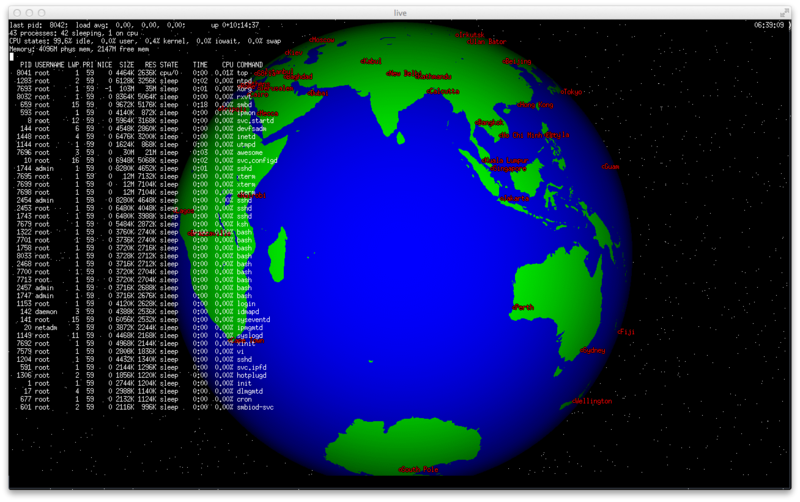 I'm planning a beta release based on Openindiana/Illumos 151 bits. The beta will give the community a chance to provide feedback, input and possibly changes (bugs what bugs) for the actual release. There are numerous improvements and binary additions with 151 (dladm, ipadm, smbstat, dtrace 1.7, etc). With these changes, come additional dependencies and an increase in package size, which goes against EON's goals. Here's a current list of changes. Of course I'd like to hear your input, feedback and comments. Perl has been moved to the binary kit. For memory size considerations, better performance and a user modifiable perl, it was shifted from the EON (embedded) to a wget install. The version of perl has changed from 5.8.4 to 5.10.0. Pros: Lower memory footprint, better performance, user modifiable perl, full version. Cons: The binary kit is no longer optional, it's now a requirement. The Samba version of EON has grown considerably in size (approx 100Mb). This has me thinking to go with a pure storage OS model which means pushing Apache to the binary kit. So, Apache web server, would be a wget added choice along with nginx and lighttpd. Pros: Lower memory footprint, better performance, two less image to release. 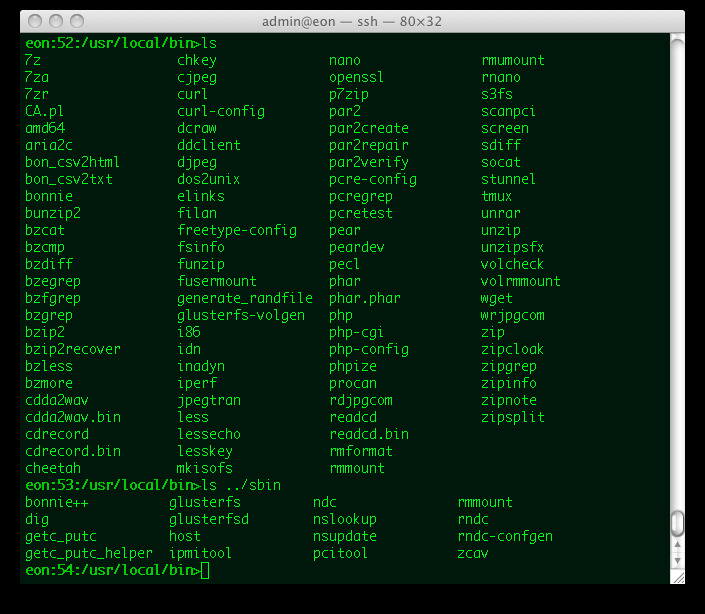 Cons: Future web admin (any takers) would require some kind of CLI kickstart. Options: Leave apache embedded and Samba users basically eat the memory footprint. 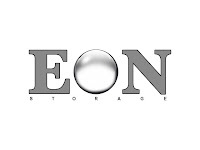 Thanks to all EON users who have sent in feedback on how EON Storage is working for you. EON will continue allowing to, store it your way. It's been a while since there's been an update. Well, after a great deal of hard, slow work, I have some good and bad news. I'll start with the good news. 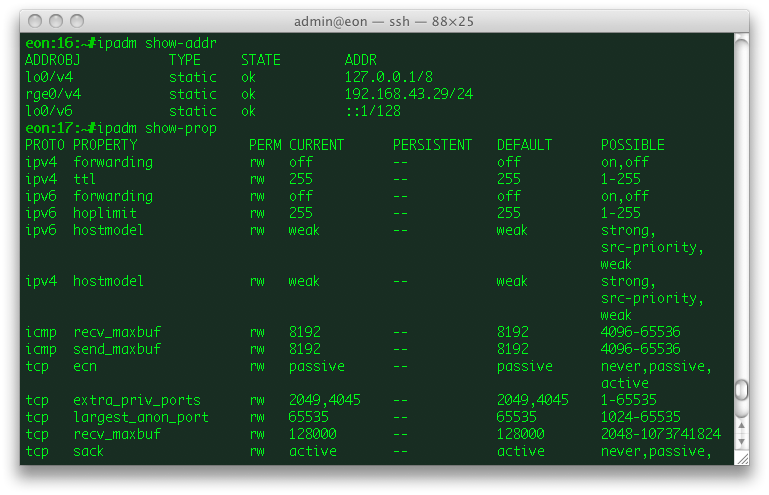 The good news is, there's a booting, 99.7% functional snv 151a based version of EON. The bad news is, this version is not distributable as it's built from Oracle repositories. 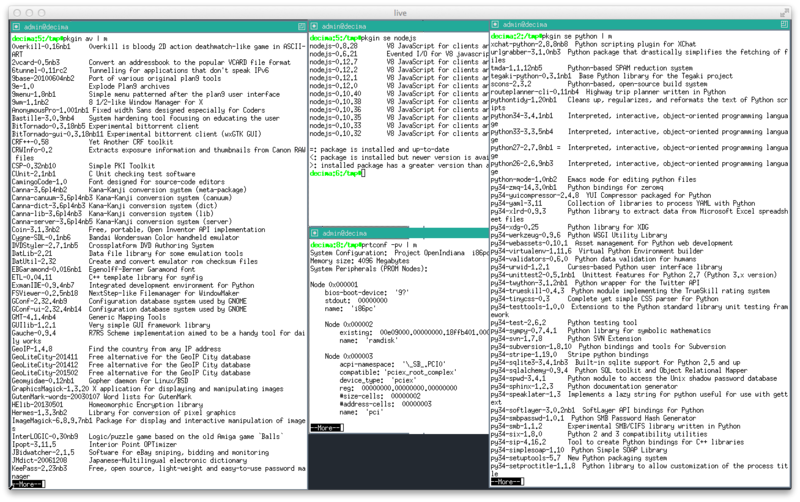 I decided to use Oracle's repository as a test of process when I could not get a booting Illumos or Openindiana based version. They all panic and reboot after loading the kernel. The good thing here is the process building an IPS image seems to work. 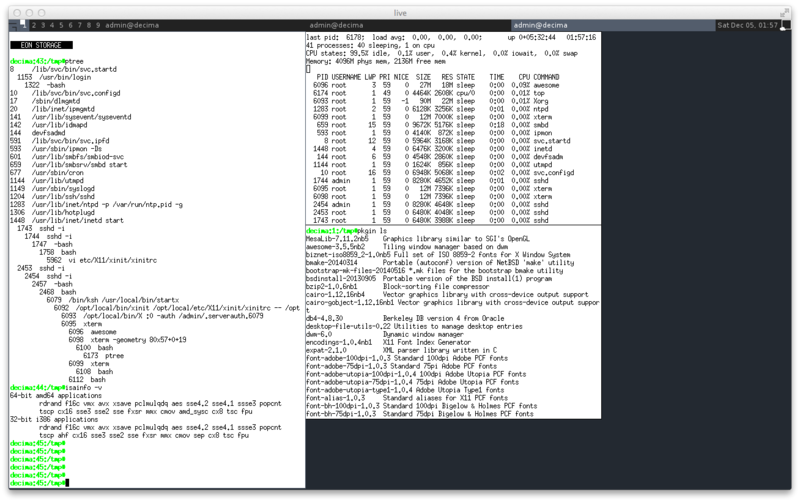 So it means back to trying with Illumos and Openindiana. 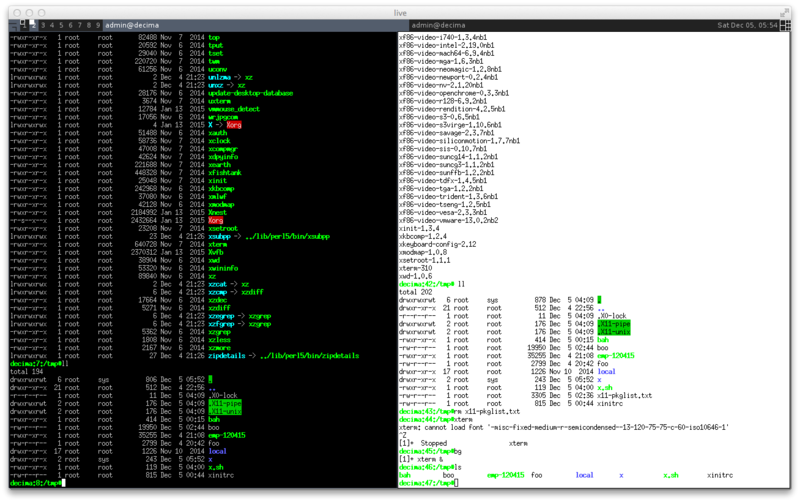 Here are some screenshots of the snv 151a version. In most cases your storage is accessed/utilized across a network using a client PC. So testing will involve a source, destination and the network that connects them. The source will be your client PC and the destination will be your EON ZFS storage. 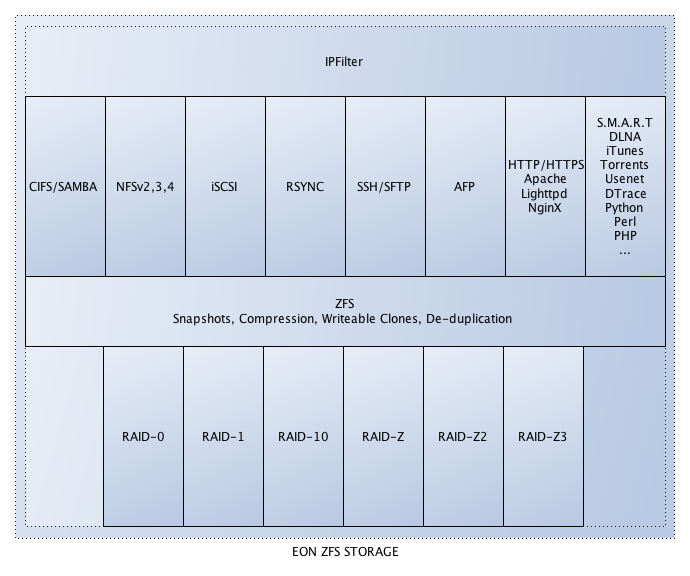 This will help identify what the network is capable of, is it working properly or if it is a bottleneck to your storage. The above says, run 1 process thread P=1 for a test duration of t=20secs with interval i=1sec updates and a TCP window size w=8 in kilobytes. The results will be formatted in (m) megabytes. This will produce an output showing the upper bounds of your network between the source and destination. It may also help identify the optimal TCP window size for your network. The output below will show the different transfer rates with each change of the TCP window size from 8k to 64k, on the client on a gigabit network. So lets begin. With TCP window set to 64K, Max throughput is approx 768Mbps/8bps=96MB/s. Possible upper limit near 99.13MBytes/sec (not the theoretical 1000Mbps/125MBytes/sec). The optimal TCP window size for this network is probably 48K (should have tested 56K also). A larger TCP window size of 64K did not provide the highest transfer rate. By now Oracle's leaked letter and the fate of Opensolaris, source gates closing, is probably well known. It seems that Solaris 11 will be Oracle's sole OS focus, and while it's unknown if it will be open source or not, the opensolaris community and it's users were ignored, abandoned and left facing a nasty dose of hard realities. The options left for the opensolaris community (including EON ZFS Storage) were bleak. Sun Microsystems was built on great innovation and thanks to a previous Solaris kernel engineer Garrett D'Amore and the open-source effort called illumos, there is new hope. It's stated that illumos will be 100% community driven and owned and many smart people who are committed to opensolaris and ZFS have signed on to breathe life into this effort and free our reliance from Oracle's handouts. 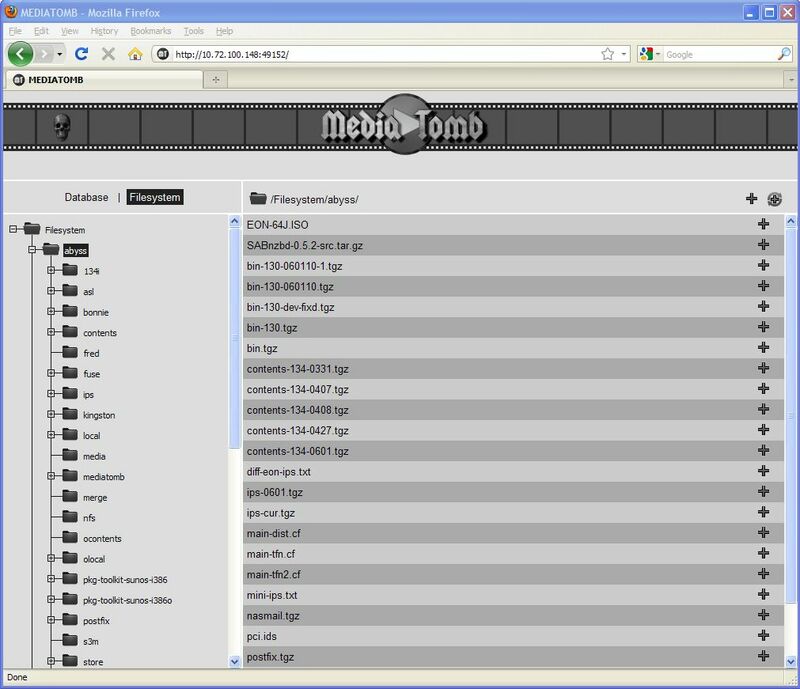 MediaTomb is an open source (GPL) UPnP MediaServer with a nice web user interface. It allows you to stream your digital media across your home network and listen to/watch it on a variety of UPnP compatible devices. Mediatomb is now available for your EON ZFS NAS in the download section (mtombaa, mtombab) and can be added using the following steps. The binary kit MUST be installed for mediatomb to work. 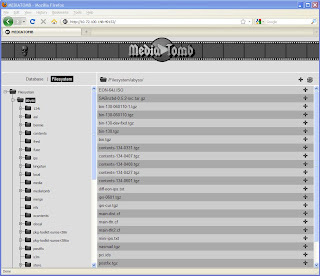 So let's get started by downloading and re-assembling the mediatomb package. NOTE: The following steps should be performed as user id "root" unless otherwise specified. Next, let's create the necessary directories and unpack the mediatomb package. Let's add the following entries to /mnt/eon0/.exec, so mediatomb will start automatically when the EON ZFS NAS is booted. And finally, to start mediatomb. 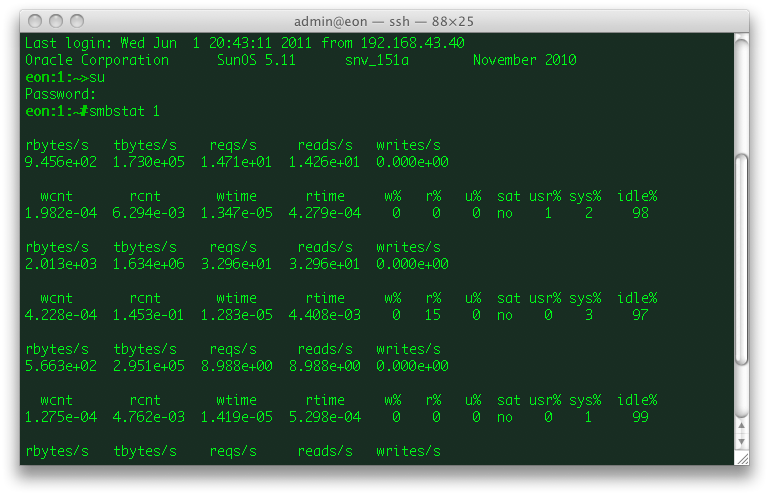 If all went well, you can point a browser to EON NAS http://ip:49152/ and you should see a image similar to the image below. Let the movie streaming begin. EON 0.60 ZFS binary kit snv_130 released! Here it is finally, the long awaited EON 0.60 binary kit release based on snv_130 and other GNU compiled binaries. Hopefully, it was well worth the wait. I tried to complete all the requests for various packages but was unable to integrate them all cleanly (sabnzbd + dependency python) in this release. I will try to get the missed ones at a later time. It is uploaded in 5 parts. You can download bin-130a[a-e] manually and transfer all 5 files to your EON storage for installation or follow the steps below, which assumes you are using wget from an prior installed binary kit 124. So let's retrieve the files. These steps also assume your EON storage can reach the web. If this is the first time using a binary kit, you will need to perform this step. If you have used previous binary kits, you can skip to the next step. This step installs the new binary kit to /usr/local which is linked to /zpool_name/local.